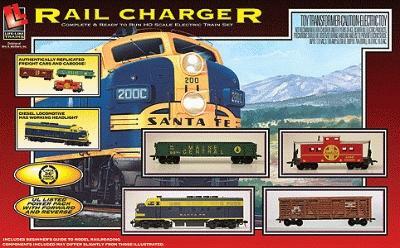 This is a Rail Charger Model Train Set HO Scale from Life-Like Trains. Retail $63.99 SAVE 24% ! Cool looking train. Great for starters has the basic needs. The amount of track is limiting but it gets you started. Note these come with plastic horseshoe couplers. Climb in the cab and discover the fun of HO model railroading with this classic diesel freight set! Up front, a powered F7 diesel with working headlight pulls a fully assembled stock car, gondola and matching eight-wheel caboose. Operation is easy with a UL-listed power pack that provides speed and direction control in one unit. The 36" 91.4cm track circle comes with a special rerailer section that makes it easy to put the loco and cars on the track. Additional accessories include hookup wire, plus extra rail joiners and a pair of couplers. Complete instructions are included, along with a copy of the "Beginner's Guide to Model Railroading" with 32 pages of helpful hints and tips! "good buy for cheap train set"